When Grades of Green partners with sports teams, you know it will have an eco-twist! 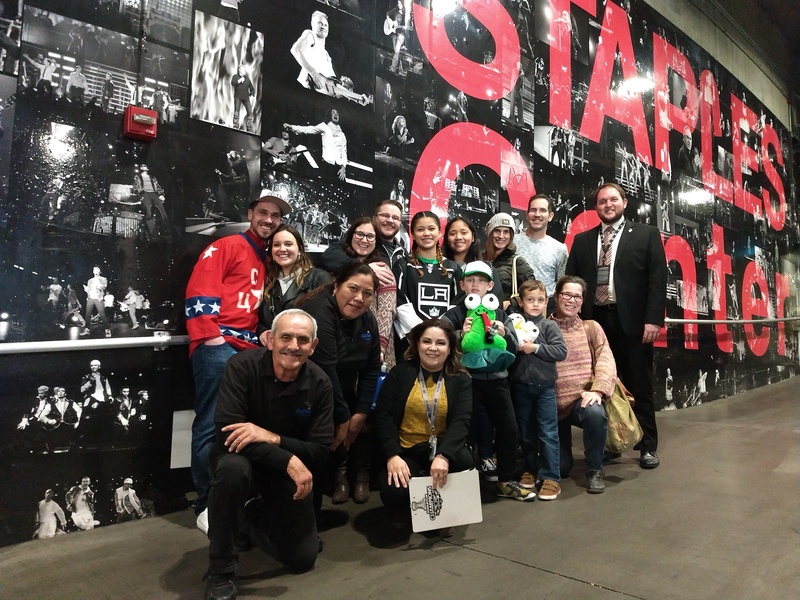 Not only did Grades of Green guests enjoy the Los Angeles Kings versus St. Louis Blues hockey game on Sunday, but our group was able to take an exclusive behind the scenes eco-tour thanks to our partners at the Kings Care Foundation. Our group met with the Staples Center Sustainability Manager and learned all about the waste reduction efforts that take place daily in this 950,000 square foot venue. For example, e-waste collected is up-cycled and reused, and food waste from the kitchens is collected to be composted. Grades of Green guests were inspired to learn all that the Staples Center does to reduce the venue's environmental footprint, and were reminded how important it is for venue visitors to sort their waste properly into the recycling containers. Waste reduction is on our minds after this awesome tour, especially as our Waste Campaign kicks off this month! To follow the students around the world who are participating in the Waste Campaign, find us on Facebook and Instagram @gradesofgreen.